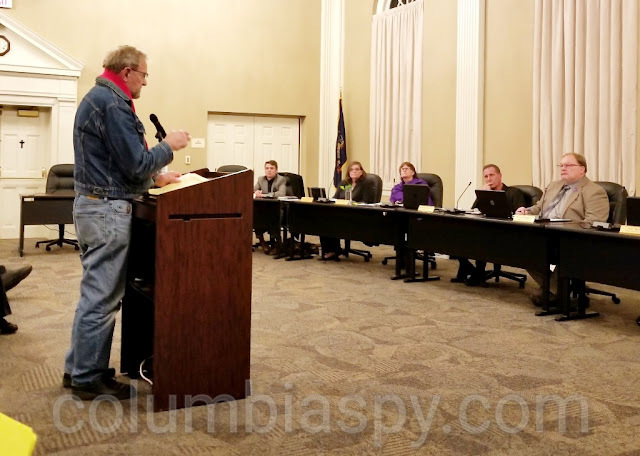 Comments at last week's council meeting focused primarily on the recent municipal tax hike and revolving loan fund, with sentiments - pro and con - evenly divided. Of the 21 residents who signed up to speak, not all did so - for various reasons. 12 commented on the tax hike/loan fund, and four spoke on other issues. As with the month's previous council meeting, the atmosphere was contentious, with some comments eliciting groans or laughter from the audience. 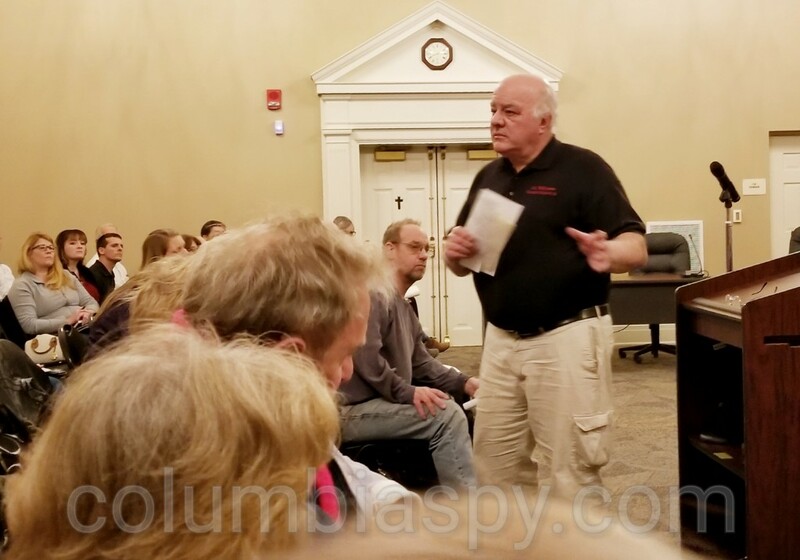 The meeting was also punctuated by several outbursts, with one man shouting from the back of the room as a resident began to speak at the lectern, and a woman shouting as she left the room. An audience member also repeatedly shouted "Vote 'em out!" several times during the meeting. Heather Zink: "I struggle to think of any business that would continue to operate at a deficit, pulling money out of savings while still spending large sums of money." Resident Heather Zink said she was upset at the tax increase. 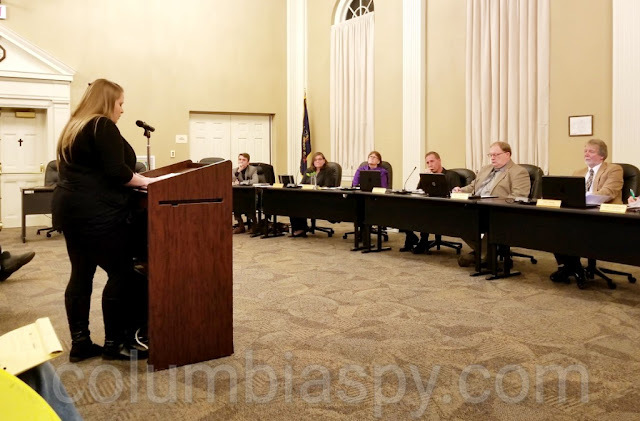 She said she had hoped that petitions recently presented to council would serve as a catalyst for dialogue between residents and council but was disappointed at the last meeting when council president Kelly Murphy read a prepared statement instead. "How can you make up your mind before you even heard what we had to say?" she asked. Zink said she was also upset by a part of the letter that characterized the general fund as the cost of doing business. "I struggle to think of any business that would continue to operate at a deficit, pulling money out of savings while still spending large sums of money," she said. Zink told council that it felt like a punch in the gut when it "sold us a bill of goods." Zink also noted that, according to the ordinance, the limit for an individual loan is $1.5 million "Why would we allow one loan to completely wipe out the fund?" she asked, adding that the fund would need to wait for repayment before lending any more funds. Zink named other local businesses and asked if any of them needed to borrow money to get started. "So, if none of those businesses needed borough funds, why is there a sudden need to create a loan fund now?" she asked. Citing a comment from the last meeting, she said: "We need to stop putting so much stock in getting people to visit, and we need to focus on getting them to stay." Taylor Callaway: "We are at a critical point in Columbia history, a crossroads in which we will either rise or fall back to being a tumbling town look down upon by its neighbors." Taylor Callaway said she has lived in town for seven years. "We are at a critical point in Columbia history, a crossroads in which we will either rise or fall back to being a tumbling town look down upon by its neighbors," she said. "We have a great opportunity." She said she sees many exciting and encouraging things happening in Columbia. "There's revival happening here, and I can't stress enough its impact," she said, citing "the restoration and rejuvenation of a number of buildings and businesses." Callaway said the planned downtown hotel will provide jobs, income, and an influx of visitors. "So many of these wonderful projects are made possible by our tax dollars and their matching power through grants and through other investors," she said. "Simply put, it takes money to make money." Callaway urged residents not to mar progress with petty arguments and finger-pointing. "We cant all agree on everything and that's okay. Changes are happening, and I do hope you'll take part." Frank Doutrich: "It's a matter of doing the right thing." Frank Doutrich asked council members if they had a copy of the financial report for the last meeting when they voted on it. Murphy said they had. Doutrich said that when he picked up a council packet at the borough office, it did not contain anything pertaining to finance. He said he had asked three people affiliated with the borough about the issue and was told it would be discussed at the present meeting. "Why did I not have a packet?" He then asked borough manager Rebecca Denlinger, "If you had a copy of the finance report, why didn't we, the public, get that? The only thing I can figure is you didn't want us to have it." Regarding a looming legal battle over the revolving loan fund, Doutrich said, "It's not about who wins this. It's not being done to see who wins. It's to see who don't lose. It's a matter of doing the right thing." James McGinness: "You are the people that the council has to answer to." James McGinness, who grew up on Manor Street, thanked the audience for attending meetings. "You are the people that the council has to answer to," McGinness said. 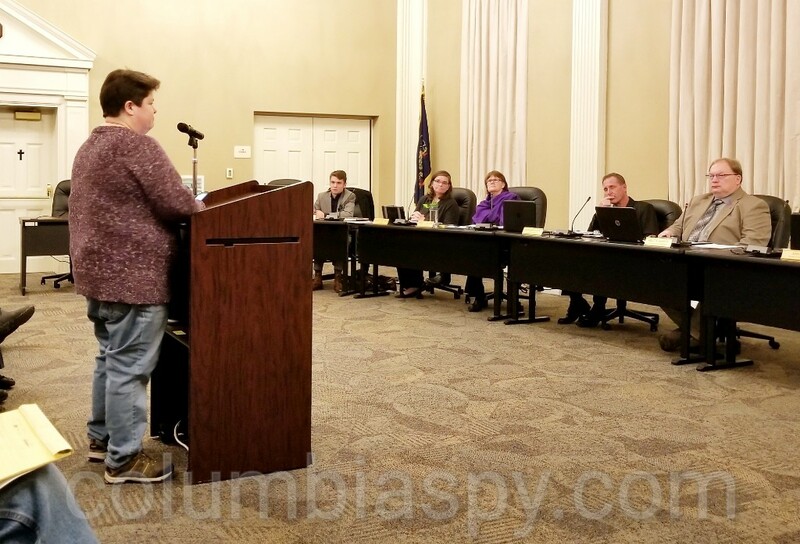 He then turned towards council members and said, "It appears to me that a lot of you don't care what these people think." McGinness chided council about fiscal responsibility. "You have to realize you have to work within your budget, and you have to segment these increases," he said. McGinness told council that people have a hard time making ends meet. "Things have to change, ladies and gentlemen. These people deserve better. You represent the taxpayers of this town. The taxpayers entrust you with spending their money judiciously, and in my opinion you're not doing it. These people deserve better, and this all has to change." Shelley Poe: "The majority of us don't want this. And you need to hear that." Shelley Poe said she is new to the area, having purchased a home here about two years ago. She said she had just found out about the tax hike and is angry about it. "I'm pretty teed off," she said. "I'm highly upset because to try to promote other businesses, in order to do that through taxpayer dollars is wrong. Most people when they want to have business, they scrape and they scrimp, and they do all that they can with family members, with friends. They don't go to taxpayers for money to help with their businesses." Poe, a veteran, added, "This is unjust, and it's very important that you all listen to people who make less than what you make, people that make less than $50,000 a year." Councilman Cleon Berntheizel later attempted to interrupt, but she said "I'm not finished. The other thing you need to remember is, if I have to pay that I won't be able to visit these businesses, because I certainly won't be able to purchase things from these businesses." She said she will struggle to pay the taxes and told council she is a law-abiding citizen and re-emphasized her anger over the hike. "I'm here to tell you I'm not happy about it, because I feel like, as this gentleman [McGinness] said, you're not listening to us. The majority of us don't want this. And you need to hear that." Kay Leader: "The motives of this council are pure, and their decisions are based upon what is good for this borough that I love." Longtime resident Kay Leader said she loves Columbia. She said there was a time when she was hesitant to say she was from here, because of negative opinions about the town, but that her feelings have changed. "I feel we're moving in a very positive direction with vision and goals for the future," she said. "In my opinion this is a result of decisions that have been made that are changing how we look, and I'm giving credit to our borough council, to Rebecca [Denlinger], to the mayor for those positive changes. They have been willing to look for opportunities for development and growth in a town that I care about." Leader added that she wants to believe that this direction will eventually have a positive effect on the tax base and subsequently on residents' taxes as businesses and visitors are enticed to town. She said that residents need to think about what they want the borough to be in the future and that she wants it to be attractive and draw people here to visit and live. 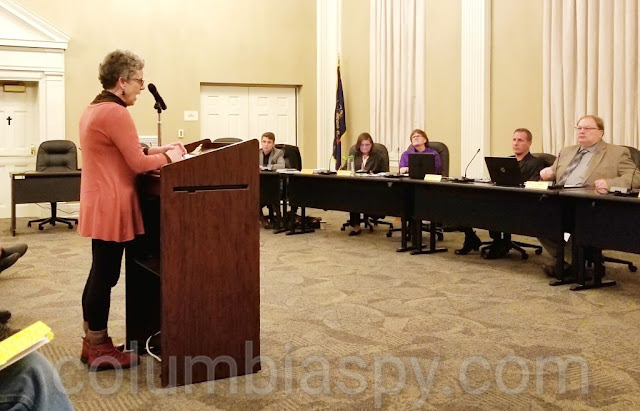 Leader added that it's okay to question council, but she believes "the motives of this council are pure, and their decisions are based upon what is good for this borough that I love." I don't frequent most of the businesses in Columbia because I can't afford to now. With the tax hike, I'll have to stop altogether. A tax hike had nothing to do with you shopping or eating there. "For the town that I love". Sounds touching doesn't it, but if you can't pay the taxes and you can't afford to get out which many would if they could, then what is the answer? If you think there is a "revival", then YOU that think that fund the growth from your own pocket and let the people just trying to survive to ourselves. SOME people are tying to build legacies plain and simple at the taxpayer's expense. You want to put a business here, RAISE YOUR OWN MONEY. We need ours !!! The council is not pure and doing any of these things for the residents. It is a very naive person who is snowed into believing that one. You want people to move here?? Either fix the school system or GET RID OF IT. Lower the taxes so people will move in. Those are the truths. As far as questioning the council, when is the council going to give the answers back. Its all "secret" meetings and secret moves. I was born here and was always proud of Columbia. It was a great place to grow up. NOT anymore. I hope all these people keep coming to the meetings and don't back down on the loans. We do need an over haul in our town government. What if I can't pay my taxes who will help me? We also need more businesses like Kmart since it will be leaving. Too many eating places who can afford to eat out all the time. A mini Walmart would be good too with a variety of things similar to the old Woolworth and Ben Franklin stores years ago. I pledge allegiance to Columbia and to the developer for which it stands. One town, over taxed and under seige. With projects and pipe dreams for those who can afford it. Kay Leader also said people should not be relying on Social Security payments to live off of. I guess she thinks most of Columbia's senior citizens must have a livable pension and a flush 401k. I believe she's wrong. Actually, it was Mary Wickenheiser who alluded to Social Security. Her comments will appear in Part 2 of this article. Mrs. Leader has no business telling ANYONE what they should or should not be living on. She should tend to her own business. No one has the right to pass judgement on anyone's financial status. At the end of the day, the town does not have money to spend and certainly not to lend to people who can take out their own loans with actual payments back on those loans. Does everyone realize the next big hit will be their grandiose River Park. How much do you think that will raise your taxes so you can read a book on a hammock? Necessities for the residents is first. It took a long time for them to put us in this hole, don't burden the people with even more. Mrs and Mr Leader are both retired school teachers, living off of hefty pensions and Cadillac health insurance, provided to them by taxpayers. They have no business in these discussions as they represent less than 1% of this community. I also was born in Columbia, but not raised here. Hanging out with my grandparents who lived on Manor Street is how I developed a love for Columbia. I remember lying in bed at their house, listening to the train whistles. Many fond memories like that are what led me to purchase my first home in Columbia. That is not a decision I would make again. I know I would have had more money in my pocket over all those years had I lived in another school district or municipality. Our quality of life here was nothing to brag about, but we were maintaining our home and paying the taxes. Now we have a situation of TAXATION WITHOUT REPRESENTATION because this council, in a prepared statement, chose to ignore 1,160 taxpayers. I challenge those six people, who spoke in favor of using taxpayer dollars to fund private business, to collect 1,160 signatures in favor of their position and present them to council. Sharon, excellent point about the 6 who spoke in favor of this ridiculous tax increase and taxpayer funded loan. that challenge...the 1160 signatures...MUST live in Columbia and OWN their homes and or business. Quote From Obama, My Administration is committed to creating an unprecedented level of openness in Government. We will work together to ensure the public trust and establish a system of transparency, public participation, and collaboration. Openness will strengthen our democracy and promote efficiency and effectiveness in Government. Yesterday’s Municipal breifs in the LNP states the council meeting was “dominated” by those in favor of the tax increase. Your coverage does not give that impression. Would you care to comment. Judging from the LNP article, we must not have been at the same meeting. We did not see an LNP reporter there and have contacted two people at LNP to ferret out the source of the information. The word "dominated" is subjective and emotive - and inaccurate. 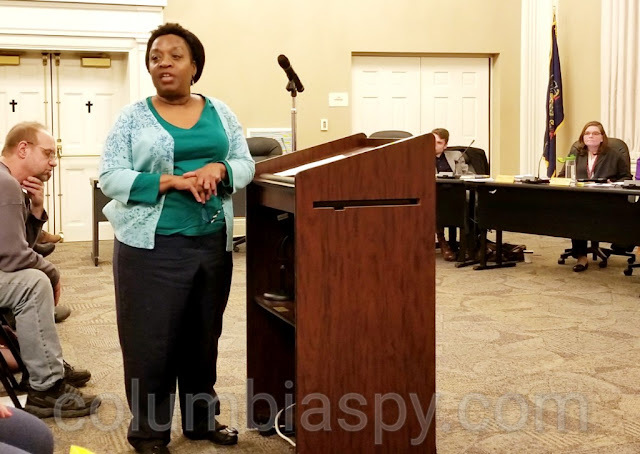 As you'll see from part 2 of citizen comments on Columbia Spy, sentiments were evenly divided. The LNP article also suggested that this meeting was less contentious than the first. Not true. There was much applause - as well as shout-outs, murmurs, moans and groans. LNP has a responsibility to state what was their source for this reporting. So the question is was it just lazy reporting or is it agenda driven. It appears that lazy reporting is certainly part of it; most likely this story is strictly hearsay. It may seam far fetched to think there is an agenda behind the reporting of Columbia Borough news but LNP does have reasons to cozy up to local councils. While they are not competing against other newspapers for stories they do still need to “scoop” the electronic media. Good relations with those in the know are very important in this regard. In addition, they desperately need to hold on to their monopoly on legal notices. Good relations with local politicians may also be seen as a way to hold on to this revenue without which they may not survive. I look forward to the day when the legal notice monopoly is broken. It is only when LNP fails that a legitimate LOCAL news outlet will emerge. Good observation. LNP was concerned about advertising, as noted in June 2016 when the borough was looking to move ads to Central Penn Business Journal. Who gives the LNP the information of our meetings? That article was not true I was there. Please don’t quote Obama if you are trying to make a point about openness and transparency of government. You may have forgot about the Benghazi fiasco that cost American lives including our ambassador. Let’s not forget about the billion dollars that were delivered to Iran but not mentioned until much later in the infamous Iranian nuclear deal. There is much more but you get the idea. Transparency is needed in government, but quoting anyone who has served in Washington, probably not the best example. Benghazi and iran? Have you reached enough points to earn your "outraged patriot conservative" participation ribbon yet? I think you figured it out out why I posted Obama's quote. Get it!!!! You assume that none of us on here actually know who these council people are. You think some of us aren't friends with them? Think we aren't privy to some of their personal antics? You don't realize that many of them have relatives that live here? Oh please,these people are known. To use the word "honest" when describing half of them is a misrepresentation, and I use a kind word. They didn't get elected because they are so far removed from the community. They got elected because they ran unopposed. THAT won't happen again! And to further address your comments, this council president has been on council for 12 years. Why were the taxes not raised, if needed, a few years ago? Why such a drastic raise? This could have been done in smaller increments had it been necessary. Again, many of us see the frivilous spending that has been happening under THIS council for the past 3 years. Please stop trying to pull the wool over the eyes of the very people who attend these meetings monthly, and have for years. And just because the mayor and council explain something to you does not make it right. They have a way of choosing their words and before long people are eating out of their hands. It's sad that residents are so quick to accept their "explanations." Hear it at meetings for yourself, then decide for yourself. Tax increase or not, this loan program is wrong. Let these big feeling residents invest in these businesses if they're such great deals. I didn't assume that you don't know these folks, its a small town, I hope you do know them. I would also say that many of these folks got elected, not because they ran unopposed, because that's not entirely true as I recall from my voting booth, or because they are far removed from the community. To the contrary, I think many of these folks win elections BECAUSE we know them. They are our neighbors, friends for church or the fire company, distant or close relatives, people we grew up with and attended school together. They are just like you. And just like you, they don't want a tax increase either. That's what I learned discussing these issues with the people we elected. Fair point, just because they explained it to me doesn't make it right. But just because you don't agree doesn't make it wrong. I listened to them and their explanations make sense to me. So, i decided for myself. What I decided is like everyone, including our elected folks, I don't like a tax increase. I also don't see many other options. The Steinmans LNP have a lot to do with decision making in town and private agendas.They hold Wright's mansion and the Columbia Reading Depot building and guide through articles in the newspaper to try and sway public opinion. They like most publishers cater to what fits there agenda. Not true reporting. I think you are trying to say what a lot of people have been saying “fake news”. People are starting to realize that newspapers no longer just report the news, they editorialize every article. The editors slant all their articles to match the paper’s agenda. They work under the assumption that we the readers aren’t smart enough to interpret the meaning of news articles. Therefore they will tell you what to think, what you heard and what it means. fake news. yes. the media is NOT reporting the real news, the truths. they prey upon uneducated people. and don't forget, the new Boro Manager is making $100,000.00 a year. Hell, Norm only made like $70,000.00 and like him or not, he did look out for the citizens, he tried to do the right thing. If he were Boro Manager he would NEVER EVER have allowed all the frivolous, nonsense spending of the past couple years. We wouldn't be in this situation. And now Phase III will cost us another $8 MILLION MOST LIKELY...MAYBE MORE. Pick your battles. Maybe the whole town should refuse to pay the spring taxes. They can't file suit on everybody. Let the goody two shoes who spit off in these articles pay. See how socialism really works. Then the bad swearing council member wouldn't have to pay his taxes AGAIN. Oh yeah and Where are the names of the people that owe the 668K in back taxes? How do they get away with that? Lets use them as the catalyst model. Lets also be sure the people making these decisions and running the town LIVE in Columbia and suffer the same. New rule, New law. 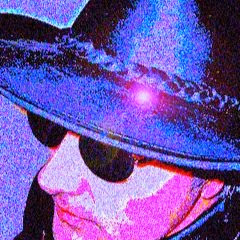 We need Norm back and he is a Columbian who CARES for us not just to make a lot of money. He grew up here too he knows what it's all about living here. I hope he runs in this election. He is not a hot head either. He knows how to conduct a meeting. You can choose not to pay your tax but most of us have them built into our mortgage so not a choice there. The non tax payers were named, all of Lancaster County actually. This site I believe had the post. And after so long of not paying taxes your home will go to sheriff sale. Not a feasible solution. If the tax "MUST" be increased fine. However I believe the real true issue here is the overspending. Council needs to be held accountable. No revolving loan fund. If you're going to have it there needs to be a cap on it. And if given the loan then no tax break on top of that. Double dipping not allowed. really? The remarks about you shouldn't plan on living on just your SS? HOW DARE YOU. Do you forget/how can you forget that this Boro is low income/poverty level? You kill the hardworking middle class who own their homes and pay taxes. We ALL have to carry the extra burden of NON TAXPAYING residents, of which there is a very high rate of. Do the math. Figure it out. INSTEAD OF SPENDING OUR MONEY SO IRRESPONSIBLY USE ALL THE TIME YOU TO FIGURE OUT HOW TO FIX WHAT'S BROKE. AND ITS A LOT. The extremely high number of rental properties in the boro; the craziness of what 8 or 10 code dept officers-to what, harass the same people over and over about a lot of times nonsense. what don't you get? we can barely hold onto our homes with the taxes. and you want me to paint my house? hell if i could afford to i would. MIND YOUR OWN BUSINESS. THIS IS BS. where is the Boro Management????????????????? I agree wholeheartedly with you. We need to cut down on employees and look what the Boro Manager gets and not even paying taxes here. They need to form a CUT DOWN committee. Do you people not see your hate? THIS is just the beginning of what you have wrought. Some of these people who spoke are some of the nicest, sweetest people. So what if they worked, retired, and did their time and are now reaping the benefits of their hard earned gains? But to tear them down? Shame! THIS is how you want to run Columbia and bring people in? Good luck!